Our London, Ontario, practice is known for customizing skincare solutions for a range of different concerns. DermEffects’ board-certified dermatologist, Dr. Wei Jing Loo, and her team of aesthetic skincare specialists offer a menu of treatments that includes customized facials and chemical peels of varying strengths to address your specific needs. Mild and moderate medical-grade chemical peels using alpha hydroxy acid (AHA) penetrate deep into the skin, removing impurities and dead skin cells. Peels can improve the skin’s appearance without the downtime of more aggressive peels when performed by our licensed esthetician. We also offer laser skin resurfacing treatments as alternatives to chemical peels. This peel is specifically designed for individuals concerned with hyperpigmentation, signs of aging, and superficial skin imperfections—regardless of skin type. It will aid in fading dark spots, improve skin tone and radiance, diminish fine lines, and improve overall laxity of the complexion. We can customize this peel for use on all skin types and sensitivities to specifically treat initial signs of aging, pigmentation, and mild skin imperfections. It will improve overall skin tone, diminish fine lines, and reveal a beautiful, radiant complexion. The Carbon Spectra Peel is a painless, no downtime, highly-requested procedure that instantly creates a radiant, glowing appearance. Ideal for all skin types and those wanting to improve skin tone and texture. It targets the melanin (pigmentation) in the cells then breaks it up to be removed naturally. It heats deep into the dermis, causing the skin to contract and stimulate collagen regeneration. During your treatment a light layer of Spectra carbon lotion is applied to your skin. This needs 5-10 minutes to set. One pass of the laser sets the carbon onto the skin. Patients will hear a snapping sound when the laser is fired and will feel a slight tingling or warmth sensation as the laser removes the carbon along with the stratum corneum (top layer of skin/ dead skin cells on the surface of the skin). After the skin is cleansed of any remaining carbon, a Vitamin C mask is applied from our SkinCeuticals skin care product line to the treatment area. This is followed by our Healite (red light therapy) treatment. This pain-free and non-invasive treatment delivers concentrated energy deep into your tissue to affect your body at a cellular level. This is a great treatment for subsiding active acne and promoting skin rejuvenation. This treatment can be used as a standalone therapy or can be combined with nearly any other procedure to enhance the effects of healing and speed recovery. DermEffects offers pampering facials and cleansing chemical peels using SkinCeuticals, our professional-grade skin care line. Maintaining, healthy, vibrant skin involves limiting sun exposure, staying hydrated, and using high-quality skincare products. Even if you diligently follow these habits, though, your skin can benefit from periodic facials performed by an aesthetic specialist. At DermEffects, we offer a variety of facial treatments that can address different skin concerns. This treatment is ideal for dehydrated and aging skin, in addition to skin damaged by sun exposure and other environmental conditions. We use specific cleansing, toning, masque, and protective products that help your skin appear firmer and healthier. We customized this facial to address the unique needs of patients with sensitive skin or who have rosacea. This facial reduces redness and flushing, alleviates discomfort, and helps reinforce the skin’s barrier function. It provides cooling, soothing relief for sensitive skin while improving the appearance of rosacea. This facial is perfect for clients experiencing congested pores, including teenagers and young adults. It combines products to help reduce the skin’s oil production, draw out impurities, and minimize inflammation associated with acne. Our cosmetic and medical dermatology practice offers comprehensive skincare treatments, which include advanced skincare products that both protect healthy skin and correct skin conditions. We recommend skincare products that include medical-grade, topical, antioxidant serums which are important year-round to help fight free radical skin damage from the environment. 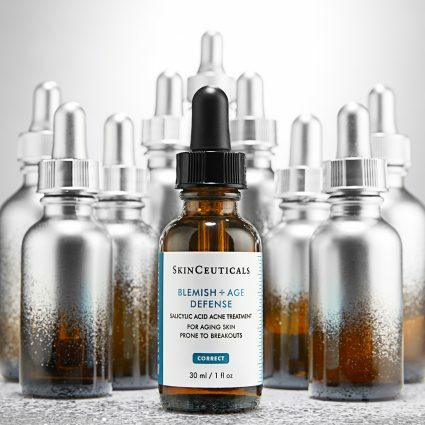 One of the most respected skincare product lines, SkinCeuticals is designed to prevent future skin damage and correct previous damage. These science-based products address a range of concerns for all skin types. These concerns include acne, rosacea, hyperpigmentation, dryness, and aging. 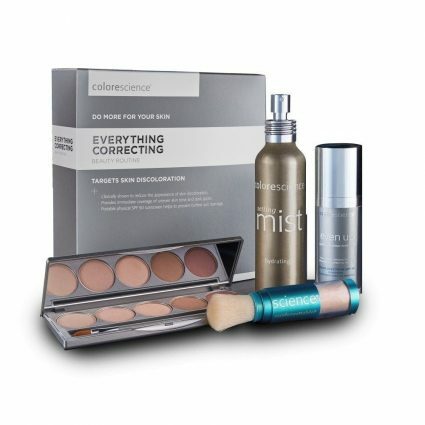 Colorescience blurs the line between makeup and skin care using completely natural, healthy cosmetics that protect and beautify your skin. The pure mineral makeup can be used on all skin types, even if you have acne, rosacea, or sun damage. DermEffects offers a prescription-only solution for patients who want fuller, longer eyelashes. The medication bimatoprost gradually encourages growth of longer, thicker, and darker eyelashes. It is applied along the lash line of the upper eyelashes and works when used daily for at least 2 months. If you live in or around London, Ontario, or even as far away as Chatham-Kent or Sarnia, and are looking for the best skincare options, request a consultation using the online form to meet with Dr. Loo at DermEffects. Or call us at (519) 472-8686 to schedule an appointment.